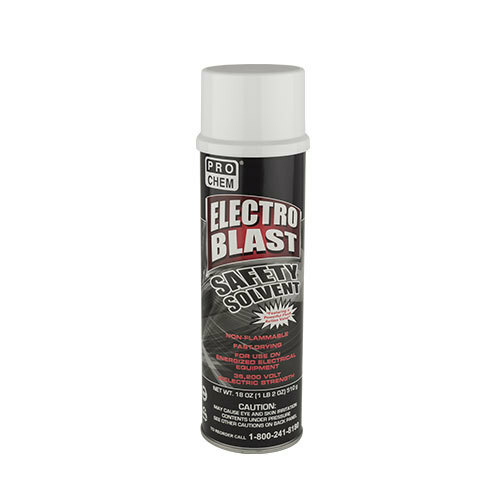 Electro Blast | Pro Chem, Inc.
ELECTRO BLAST is a fast drying, nonflammable, nonconductive, solvent cleaner and degreaser spray. It contains trichloroethylene, an accepted replacement for 1,1,1 Trichloroethane under the EPA SNAP program. Its powerful flushing action penetrates through and removes grease, grime, dirt, tar, wax and other contaminants. The dielectric strength and nonflammability of the product allows it to be used on electrical equipment and machines, even while energized. DO NOT USE ON PLASTICS.